As I mentioned in the last article, locking differentials are employed to help vehicles in low traction situations that standard differentials are not designed to overcome. Where standard differentials apply power to the one wheel with the least traction, locking differentials apply some power to both wheels. This ensures both wheels are contributing to moving the vehicle. The benefit of this is when one wheel is on a low traction surface, the wheel with better traction can still move the vehicle off that surface. There are a few different types of locking differential; limited-slip, ratchet and Torsen® differentials. to ensure both wheels (per differential) are providing drive to the vehicle during low traction. As their design and manufacture is more complicated and costly, they are more commonly applied to higher performance rear wheel drive vehicles, front wheel drive and all-wheel drive vehicles. In fact, in all-wheel drive vehicles, there may be a differential controlling the front wheels, one controlling the rear wheels and another splitting the power between front and rear wheels. Some aftermarket companies provide limited-slip differentials to replace standard differentials or to replace stock limited slip differentials for more heavy duty applications. Houston Rebuilt Axles specialize in this technique and can advise you on the most cost efficient method of upgrading your differential for specialty applications e.g. off-road use. How does the limited-slip differential work? The limited-slip differential is very commonly abbreviated to L.S.D. One type of L.S.D. is the clutch-plate differential. What are the components of a clutch-plate differential? A clutch-plate differential looks very similar to the standard differential previously described. The main difference is it has clutch plates and discs between the side gears and differential case. This is the same location the thrust washer was described and illustrated previously. See below for an illustration of the clutch-plate differential. The clutch plates are steel and have tabs extending beyond their diameter. The tabs hold the plates in slots within the differential case. The clutch friction discs are made of steel covered with a friction material. They have teeth on their inner opening through which the axle shafts pass. The teeth on the discs mesh with teeth on the side gear and thus the discs turn as the side gear/axle shafts do. As the tabs on the plates are slotted into grooves in the differential case, they turn along with the case. The clutch plates and discs together are referred to as the clutch pack. The side gear and axle shaft are separate components and there is a small allowance for movement between the two. 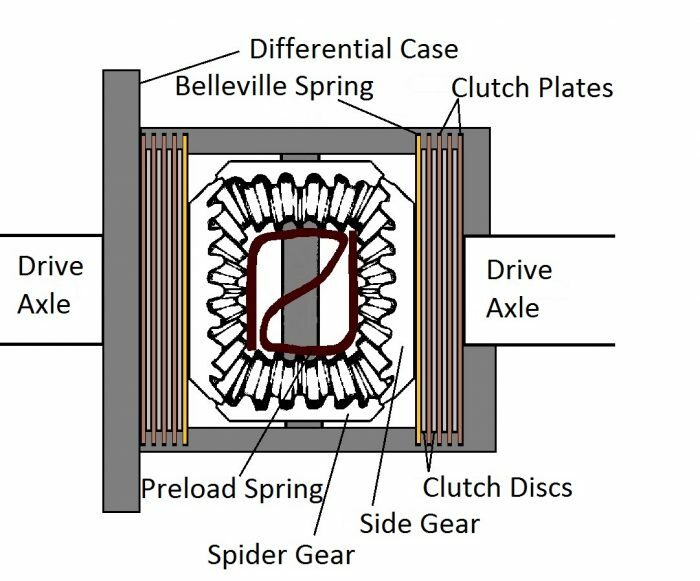 The preload spring applies some pressure to the tightly packed clutch pack. Although the preload spring puts some pressure on the plates, more pressure is applied when the engine power/torque is applied to the side gears through the spider gears. When torque is applied to beveled gears, this creates an axial force which tries to force the gears apart. This puts putting pressure on the side gear forcing it outward toward the differential case. This outward force compresses the clutch plates and discs together causing them to lock due to contacting the friction material. The torque is transmitted from the differential case through the tabbed plates to the friction discs which are now locked together. The discs have teeth engaged with the side gear which drives the axle shaft. The force is thus transferred to the axle shaft and ultimately the wheel. How does a clutch-plate differential work? When the vehicle is moving straight ahead, the differential acts like a standard differential as the clutch packs aren’t engaged. When turning or when one wheel has low traction, the wheel with the most traction has higher turning resistance than the wheel which is slipping. The engine torque applied through the spider gears to the side gear with higher traction (resistance) causes more separating force between the spider gear and side gear. This forces the side gear toward the differential case and thus engaging the clutch pack. This is how more drive power is applied to the wheel with higher traction. The side gear of the slipping wheel has little turning resistance to the torque. It does not have the same force on the side gear toward the differential case and thus does not compress the clutch plates and discs. Hence it does not apply as much drive to that wheel. The clutch pack is designed to slip while not engaged at a preset torque value. When turning, the high torque created by the outer wheel turning faster than the differential case (low resistance) causes the clutch pack to slip. This allows the differential to act like a standard differential. This is due to the lack of compression of the clutch pack allowing the plates, connected to the differential case, and the discs connected to the side gear to rotate at different speeds. If you think your differential is worn out, contact Houston Rebuilt Axles for an evaluation of your differential. We can repair or rebuild it to OEM standards. Learn about cone and Torsen® locking differentials in our next article!